User experience is at the core of every organization, from businesses based in e-commerce to those that serve customers face-to-face each day. The term “user experience” encompasses every aspect of an end-user’s interaction with a company, including the company and brand itself, as well as interface with a website, employees, and in some cases, a tangible product. However, user experience has commonly evolved to reference products and facets of an organization that have a digital interface with customers. According to industry experts, what are the main components of building a dynamic yet accessible platform for your customers to interact with your business? When it comes to your website, your interface with customers needs to have functionality. Visitors want to find interesting, relevant information; even though every visitor might be looking for something slightly different in their user experience, providing the right content is essential in keeping unique impressions rolling in. A simple, yet beautiful website provides the content visitors are looking for in both an effective and efficient format. Ease of navigation is a given when customers visit your site. However, providing your customers with ease of choosing is an entirely different story. When it comes to user experience, keep it simple. Studies have proven that the more choices we have, the more overwhelmed we are, and the less likely we are to be engaged. Give your customers the options that they want, but keep the overall model simple. Don’t make your customers jump through hoops to make a purchase, subscribe to an email list, or speak to a service representative over the phone. Less is more. All of the customer-facing aspects of your business, from your website to your front-end employees, need to adapt to fit the needs of each individual user. On your website, the user experience should differ depending on whether the user is a casual, one-time visitor, or frequents your site on a regular basis. For the most frequent users, the site should be intuitive to their needs and should recognize patterns and purchasing behaviors to make them feel like a valued member of your brand family. How can companies differentiate on their user experience design and deliver exponential value for their customers? The answer lies in the process, which should be user-focused and rely heavily on consumer insights and qualitative research. 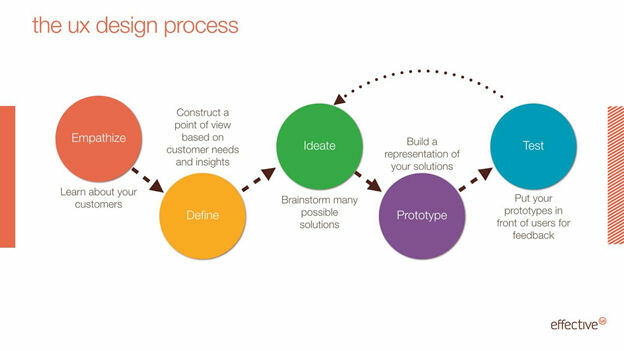 Each step of the user experience design process should involve the customer and how they interact with your product, with feedback from actual users to validate design choices. Don’t worry about first mover advantage in the design process. It doesn’t matter if you did it first; it matters if you do it best. Even if your design isn’t the most revolutionary, if it works better than your competitors, your customers will keep coming back to you for the attention to detail paid to their user experience. It’s simple to understand the components that contribute to building a fantastic experience for users. But how do brands put theory into practice to surprise and delight customers to make them lifelong advocates? A lot of brands focus on building visually stunning websites and applications, but attention to detail and ease of use keep customers happy and engaged. These brands have created beautiful but simple experiences that give them a competitive advantage through their functionality and design. While their website interface isn’t revolutionary in terms of design, KitchenAid does provide a function that is relatively unheard of for retailers: suggested search functionality with auto-complete. The suggested search tool allows for users to search for products without a SKU number or any type of product code, leading to increased ease of finding the right item. With thousands of products on their site, KitchenAid has removed a major obstacle in online shopping for its customers. Winner of the 2015 Webby Award for Best User Experience for a website, Virgin America has nailed the competition in the airline industry for ease of booking flights online. With a stunningly simple booking interface, customers initially simply choose the number of guests flying, which city they would like to depart from, and which city they would like to visit. Customers are then walked step-by-step through the remainder of the booking process, allowing them to choose their guests and cities, dates, times, and finally seat assignments in an easy, non-overwhelming progression. With over 80 million Americans suffering from heart-related conditions, QardioArm has sought to change the way that people monitor their blood pressure. This wireless blood pressure monitor is streamlined and smart, and its portable, stylish design fits seamlessly into the user’s daily life. The device is fully integrated with smartphones, and users are able to share their clinically validated measurements with their family, as well as their doctor. QardioArm is simple to use, but delivers daily value and methods for prevention through its intuitive tracking and detection functionality. In the UX world, simplicity is key. As consumers continue to be inundated with visual stimulators, a simple but engaging user experience will allow consumers to cut through the clutter and find the content they’re looking for. Use the tools on Agency Spotter to find your next great user experience agency to differentiate and deliver for your customers.